Notes: Based on the manga by Matsumoto Izumi. North American rights to KOR used to be owned by Animeigo, but has since been lost. The show is currently unlicensed. Kasuga Kyousuke and his family have just moved to a new town after an unfortunate set of events forced them to leave their previous home. They're trying to hide the fact they possess strange psychic powers ... but one of Kyousuke's younger twin sisters blew their cover after running the hundred-yard dash in ... under three seconds. While exploring his new neighborhood, he meets a beautiful girl, and he is instantly smitten, but she leaves before he can even find out her name. The next day, when he starts at his new school, he meets Hiyama Hikaru, a wild, tough-talking punk of a schoolgirl, but it seems she -isn't- the school bully everyone's afraid of ... but her best friend Ayukawa Madoka -is-. Much to Kyousuke's surprise, it's the same cheerful, mild-mannered girl he had just met at the park the day before. Intrigued, Kyousuke wants to find out much, much more about Ayukawa, but his plans are set back when Hikaru decides she wants him for herself. And thus the greatest love triangle in the history of anime begins. I don't know where to begin. There is so much about this series that I want to describe, but how can words do justice to this series? It truly is -the- anime romantic comedy. 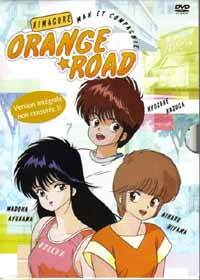 If anything, for the three leads alone, and what they go through as the series progresses, Kimagure Orange Road is worth the watch. I was in middle school during the same time portrayed as KOR, and it is one of the most faithful portrayals of middle-school life I have ever seen. Hikaru and Madoka are NOT perfect. They drink alcohol. They sneak out to nightclubs and party. And they definitely aren't as pure as fourteen-your-olds ought to be. All three are caught up in that awkward period of life when childhood blurs into adulthood, when innocence blurs into revelation, when friendship blurs into love. And through it all, they continue to grow ... but one's folly by not opening her eyes to the truth ultimately leads to her downfall, which happens in the concluding movie. How many times have we felt the same way growing up, when we didn't know who to look up to or who to trust? What strikes me in this series is that these three are such real characters ... no, people ... that you can't help but relate to them. But at the same time, it's not all serious. They ARE children, and they do have fun. This series is definitely a comedy. (I mean, the sight of the huge cat Jingoro levitating in the air, not of his own will ... multiple times at the mercy of the twins ... simply hilarious, each and every time. You really pity that cat.) And some of the episodes are downright hokey. (Like Madoka the Pick and the skateboarding contest. *cringe* Please don't ask.) Thankfully, these are few and far between, and contained mostly in two episodes that have absolutely nothing to do with the series as a whole. But it's forgivable, considering the quality of the rest of the series. Technically, it -is- dated. For its time, it wasn't particularly well-animated, but, like the manga it's based off, the art is not the selling point of the series. It is definitely the story. And later on, the plot device of Kyousuke's being an ESPer is completely irrelevant...the story isn't about how his powers create situations (i.e. Ranma + water, or anything like that), but about his personal interactions with Hikaru and Madoka. The neat thing about this series is that it keeps you guessing on who he's going to choose. One moment he wants to be with Hikaru, but the next, all he can think about is Ayukawa. It isn't until the last few episodes you realize where his heart lies, and maybe where it has been all along. But it's such a wonderful ride. The character design and artwork produced for the series are nothing short of spectacular...Akemi Takada's interpretation of the admittedly simple original manga designs are exquisite and capture the very mood of the series perfectly ... and the music as well is unforgettable. Wada Kanako's songs will definitely hit the heart ... and you will want the soundtracks and play them over and over. Yes, they're '80s J-pop ... yet at the same time, they're truly timeless. I know this may be a bit presumptuous to say, but I truly believe this series has one of the best soundtracks ever produced for an animated series, rivaling anything done by Kanno Yoko in the '90s. I admit, I can't produce a review that does this anime any justice. What I recommend is for you to watch this anime for yourself and decide. Recommended Audience: Teens and up. It -will- hit home with anyone who has gone through or is going through the trials of puberty. Anyone younger may find the Jingoro bits funny, but the rest would be over their heads. Plus the potentially disturbing allusion to the girls' usage of alcohol and nicotine, their status as gang members, and sexual innuendo would be too much for the under-twelves.